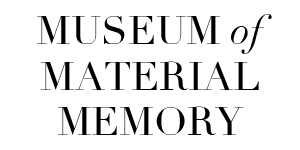 The Museum of Material Memory is a digital repository of material culture of the Indian subcontinent, tracing family histories and social ethnography through heirlooms, collectibles and objects of antiquity. It’s premise is to promote the preservation of material memory infused within objects and further advance the knowledge and appreciation of it as a significant resource in understanding culture and civilization. The objects in the Archive are from or before the 1970s. By exploring the notion of the collected or preserved object from a certain moment in time, we can attempt to gather insight into the moment of time itself. Using the object as nucleus, the project thrives on the contributions from people all over the world. Through storytelling, each post on the Archive reveals not just a history of objects and the people they belong to, but also unfolds generational narratives about the tradition, culture, customs, conventions, habits, language, society, geography and history of the vast Indian subcontinent. It was co-founded in 2017 by Aanchal Malhotra and Navdha Malhotra.